Community gardens are all the rage in larger populated areas. Several families can share a plot of well-tilled soil to grow their own fresh vegetables. Of course, there is only so much dirt to go around, and to be perfectly honest, some vegetables are more important than others. Hmm, maybe sharing with others wasn’t such a good idea. Garden Dice, by Meridae Games, is comprised of 1 game board that represents the garden, 50 Seed/Veggie tiles (double-sided; 10 squash, 10 carrots, 10 tomatoes, 10 artichokes, and 10 eggplants), 4 Bird/Rabbit tiles (double-sided), 4 Sundial/Scarecrow tiles (double-sided), 4 Player Reference cards, 4 wooden six-sided dice, 36 wooden Player discs (9 per player in the colors of green, blue, yellow, and red), 4 Sun tokens, and 2 Rock tiles. All the game components are made of wood or thick cardboard, making the very durable. Excellent quality throughout. Note: Prior to your first game, you will be required to place 36 stickers on the wooden Player discs. To set up the game, first place the game board in the middle of the playing area where all the players can easily reach it. Second, sort the Seed/Veggie tiles by type and place them in stacks with each type’s seed side facing up. The number of tiles in each stack is dependent on the number of players. Any unused tiles should be placed back in the box. The stacks of tiles should be placed to one side of the game board and within easy reach of all the players. Third, give each player 1 Player Reference card, all 9 of their Player discs (all 9 will be the same color), 1 Bird/Rabbit tile, 1 Sundial/Scarecrow tile, and 1 Sun token. If playing a 2-player game, give each player 1 Rock tile, too. All other unclaimed tiles and discs should be placed back in the game box. All of these game components go in front of the player, to be organized as they like. Fourth, have each player place one of their Player discs on the garden path that is next to the scoring track, but not yet on the scoring track tile that is marked with the value of “1” (because the player’s haven’t scored any points yet). That’s it for game set up! Randomly determine who should go first (for example, using one of the die), and begin to till that soil! The game is played in rounds with each player having a single turn per round. On a player’s turn, they will complete the following sequential steps. When completed, the next player going clockwise will have their turn. This continues until the game is over. The player takes all 4 of the wooden dice and rolls them. The dice rolled are now referred to as the player’s “dice pool” and will be used to complete a number of actions. Using the dice pool, the player now assigns each die to an action. Note that once a die is assigned, it cannot be used again on the player’s turn. Players must use all their dice; you cannot bank dice for later. This means it is perfectly possible that a player will have to assign die or dice to an action that they do not really need or want. Creative uses of the die and managing how they are spent is very important to winning the game. The possible actions follow. Buy a Seed Tile: A player can spend 1 die to buy 1 Seed tile from the stacks. Each Seed tile has a point value. The player can buy 1 Seed tile that has a point value equal to or less than the die value being used. The purchased Seed tile is placed in front of the player and a Player disc is placed on top of it, signifying that it belongs to the player. Note that a Seed tile cannot be purchased if the player has no free Player discs. Additionally, a player cannot buy more than two of the same Seed type on their turn. Place a Tile: A player can spend 2 dice to place one of their tiles. The game board is organized like a grid with each row and column having a listed die value. One die will be used for the X coordinate and the other for the Y coordinate of the grid. Where the row and column meet is the square where a Seed, Bird, Sundial, or Rock tile can be placed, but only if there is no tile currently occupying that square. If the player already has a Sundial on the board, they can use it to modify the dice for this action. A Player disc always accompanies a tile to signify who owns it. The one exception is the Rock tile. Water a Seed Tile: A player can spend 1 die to water a previously placed Seed tile. The point value on the Seed tile must be equal to or lower than the die value. The Seed tile is flipped over to now show the Veggie side. The Player disc remains with the tile. It is perfectly possible that a “chain” will now occur. Any Seed tile that is orthogonally adjacent to the watered Seed tile will also flip over to the Veggie side if the Seed tile’s point value is lower than the previously watered Seed tile. Empty spaces and Seed tiles with a higher point value break the chain. In all cases, the Player discs remain on the tiles. Harvest a Veggie: a player can spend 1 die to harvest a Veggie tile from the game board that they own. The Veggie tile’s point value must be equal to or lower than the die value. Harvested Veggie tiles score the player points. Once collected, the player moves their Player disc on the score track a number of spaces equal to the Veggie tile’s point value. Like watering a Seed tile, harvesting a Veggie tile can cause a “chain” to occur. Any Veggie tile that is orthogonally adjacent to the harvested Veggie tile will also be harvested if the point value is lower than the previously harvested Veggie tile. Empty spaces and Veggie tiles with a higher point value break the chain. In all cases, the owning player scores the points. Any player who starts a harvest chain is awarded 1 extra point for every harvested veggie in the chain belonging to OTHER players. Note that a harvested Veggie tile protected by a Scarecrow tile scores an additional 3 points and any Veggie tile placed on a Star Bonus has the point value doubled. All harvested Veggie tiles remain in front of the player, but are not stacked. Additionally, the Player disc is removed, freeing it for future use. Flip a Tile: a player can spend a die with the value of “6” to flip a Bird tile to a Rabbit tile, a Rabbit tile to a Bird tile, a Sundial tile to a Scarecrow tile, or a Scarecrow tile to a Sundial tile. The player can only flip tiles they own. Move a Critter: a player can spend a die to move their Bird or Rabbit tile in a straight line a number of squares equal to the die value. Birds eat Seed tiles and Rabbits eat Veggie tiles, but only if at least one Player disc is free (that is, not assigned to a tile). If the player doesn’t have at least one Player disc free, they cannot take any action with the Bird or Rabbit. Scarecrows protect all Seed tiles that surround it (8 squares in total). A Bird tile cannot travel through or stop on any protected Seed tiles or the Scarecrow tile. Eaten tiles are removed from the game board and the Player disc returned to the owner. The Bird or Rabbit remains in the square. Once removed, the player who just used the Bird or Rabbit can choose to discard the Seed or Veggie tile from the game and add one of their Player discs to the animal tile or have their critter spit out the seed by spending one additional die with a value equal to or greater than the eaten tile’s point value, which gives the tile (Seed side up) to the player to now use, with one of their Player discs automatically being attached. A Bird or Rabbit tile stops their movement as soon as they land on ANY tile, however, they can be moved again by spending a die and a Player disc. Rabbits and Birds cannot stop on or travel through a Rock tile. Remove a Critter: a player can spend 3 dice to remove a Bird or Rabbit tile from the game board. The first two dice represent the grid coordinates of the animal tile. Again, if the player has a Sundial in play, they can use it to adjust the die values. The third die must have a rolled value of “6”. Any Bird or Rabbit tile can be removed (it does not need to belong to the player). The Player disc and the tile are returned to the owning player once removed from the board. The one game component not yet discussed is the Sun token. This is never played to the board. Instead, a player can use it during their turn to reroll all their dice or anytime during their turn to change one of their dice values. Once used, the Sun token is removed for the duration of the game. The game ends when the final Seed tile is claimed by a player, leaving no other Seed tiles available in any stack. The player who takes the last Seed tile completes their turn as normal. Then all the players tally their points. Subtract 5 points for every Seed tile they have not placed, except the first. For example, if the player had 2 Seed tiles they had not yet placed on the board, the first would not count against them but the second one would for -5 points. Add an additional 15 points for Veggie tile sets they have harvested, where a “set” 1 of each of the Veggie tiles for a total of 5. Each tile can only be counted in a set once. Add an additional 10, 15, or 20 points for a collection of 3, 4, or 5 Veggie tiles of the same type. Each tile can only be counted in a collection once. Add 5 points for any Sun tokens still in the player’s possession. Once all the points are accounted for, the player with the most points wins the game. The game can be played in a more “family friendly” style by removing the Rabbit and the Bird tiles from the game. Other than the absence of these tiles, the game plays as normal, with the exception of players now being unable to place, move, or remove Rabbits or Birds from the garden. We suggest you use this game variant when playing with Child Geeks for the first time as it reduces the games aggressive play and reduces the number of actions the Child Geeks need to think about. To learn more about Garden Dice and read the full rules, visit the game’s web page. Garden Dice has a lot going for it right from the start that will appeal to all three of our groups. For the Child Geeks, the game play is very straight forward and the way you make points is easy to understand. Any confusing abstract concepts are removed and replaced with simple one-step actions (plant a seed, grow a seed, and pick a veggie for example). The order in which these actions must occur is already well understood. For the Parent Geeks, the game play appears very casual and fast (according to the rules). The ease of play with 2 to 4 players makes it a good one for the family or with their peer group when the adults get together. For the Gamer Geeks, there is a lot of strategy and resource management going on behind the scenes of each play. The Player discs must be carefully spent to ensure the player has a solid return in their investment and the use of the dice as a “dice pool” opens the game to a lot of possible strategies and tactics as the game evolves. Teaching the game took surprisingly little effort. Although, this could be because the majority of the players were already familiar with other games that share similar game mechanisms with Garden Dice. For example, Dark Horse and Alien Frontiers. The game doesn’t introduce anything radically new for most Parent and all Gamer Geeks, although the Child Geeks had a number of very good questions on the tile placement. Specifically, what were the best ones to place. I told them that a possible strategy was to buy cheap and chain like crazy! They all seemed to like that, and after only a few other questions, everyone was ready to play. As I set the game up for my little geek and I to play for the first time, I asked him his thoughts on Garden Dice so far. You know, he’s right. There are a lot of farming games on the market today. Won’t be too much longer until we see a Zombie Ninja Farming Pirate Apocalypse game, I’m sure. Until then, let’s play Garden Dice and see if the time we sow into the game reaps us fun and rewarding game play. My 8-year-old had a great time with this game. He said he enjoyed it because the game “made sense and was easy to play”. Yes, it is easy to play, but not an easy game to beat. 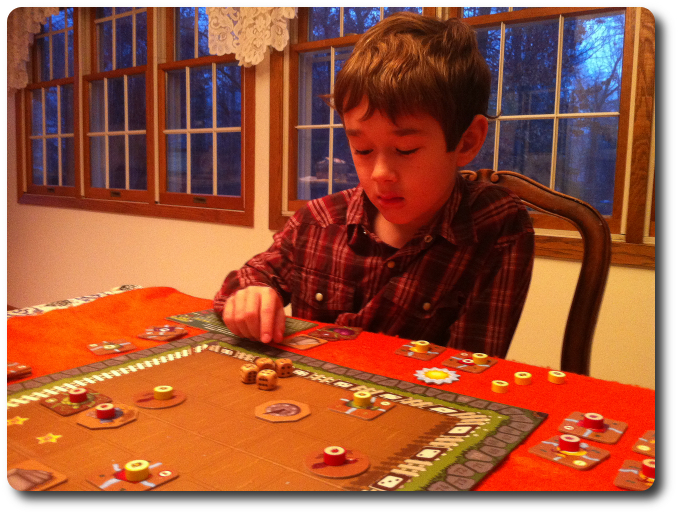 He found out very quickly that every turn in the game can either set the player back or push them ahead. The game is really all about being as efficient as possible. He quickly caught on and started to plant, water, and harvest in the same round. When he couldn’t, he’d send in his critters to eat my leafy greens. We did observe some analysis paralysis from the younger Child Geeks, which is to be expected. When given enough time to think it through, they were always able to play their turn without issue. All the other Child Geeks we played it with had a good time, too, but none of the players under the age of 8 really understood the game and were able to keep up. The Child Geeks approved this game and looked forward to playing it again. Parent Geeks also enjoyed the game. At a peer level, they found Garden Dice to be a fun, casual game they could play with noise in the background. Interruptions from the Child Geeks did little to upset the game play. As a family game, they found Garden Dice to be a good time for all involved and exceedingly well-balanced. More times than note, the Parent Geeks opted to remove the Bird and Rabbit when playing with their children for the first time. This worked well until the Child Geeks demanded the Rabbit and Bird return to the garden. Much to the surprise and shock of some of the Parent Geeks, their Child Geeks were surprisingly aggressive with their animal minions. The difference in game intensity between Child and Parent Geeks versus Gamer Geeks was very apparent from the start. While families played the game in a way that was easy-going, Gamer Geeks took gardening to a dark and very aggressive place. Rabbit and Birds were taking out seeds and vegetables like crazy, the market to buy seeds was cutthroat, and the little garden patch turned into a war zone. It was awesome. Victories were earned through good game play and smart resource management. Plus, lots of smack talk. The Gamer Geeks approved the game and enjoyed it. Garden Dice is a great deal of fun. A player who spends the time considering all their possible actions can really get their garden engine revving and make some serious points. The ability to shift from offensive to defensive playing in a single turn was a neat game mechanism that allowed players to tend to the garden and go stomp on their opponent’s vegetables at the same time. This kept everyone engaged and the game never felt like it was being dominated by a single player. 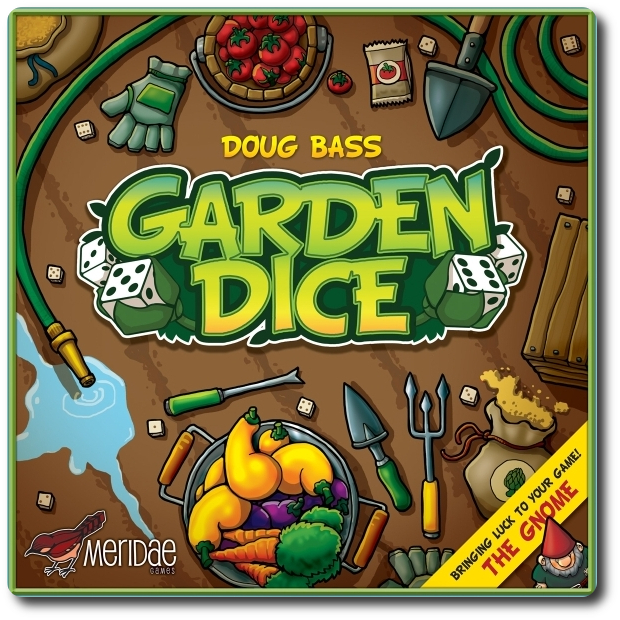 But Garden Dice is also great for those players looking for a casual game. 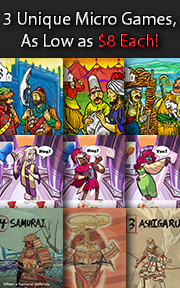 Each turn allows for many possible actions, freeing up players to do what they like and explore new tactics and strategies along the way. One of my favorite aspects of the game is the necessary and very casual resource management. A player must first manage their actions using the dice. Then they must manage their seed count and planting. Followed by watering and harvesting. If the dice were used correctly, a player could complete three to four of the possible seven actions all in one turn. The game allows this, but it is darn tricky to do without thinking it through and setting yourself up for it in a previous round. I also really enjoyed the chaining affect when watering and harvesting. This made what should be a simple water or harvest action a difficult one to make at times as it could benefit other players. I would often plant low scoring seeds next to an opponent’s high scoring seeds because I knew my opponent would water and harvest my seeds and veggies for me. And really, I think that’s the best part of this game. You can use the other players as unwilling pawns to achieve victory, but like all the other resources in the game, you had to know how to use your opponent’s wisely. If you are looking for a dice and tile game, where knowing when and where to plant a seed is just as important as what seed you use, where a great deal of freedom is given to the player to make choices without ever upsetting the game’s balance, then do make room in your game shed for Garden Dice. Tagged Dice Games, Farming Games, Father Geek Approved, Gamer Geek Approved, Parent Geek Approved. Bookmark the permalink. I got the chance to meet the designer and play at a local convention back in November. Our whole family also liked the game. We haven’t played with the rabbit and bird yet, but I bet that would make it a lot more interesting. The difference is almost night and day. 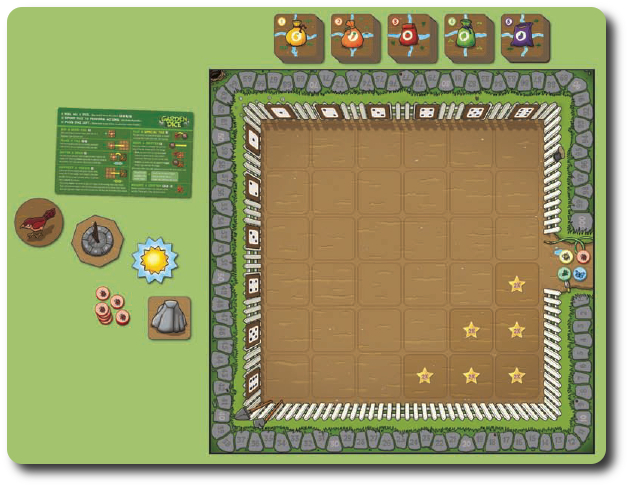 While the game without the critters is all about “first to the square” so you can control it temporarily until you harvest the veggie, the Rabbit and Bird make every play faster and more defensive. You want to plant, water, and harvest as soon as possible. 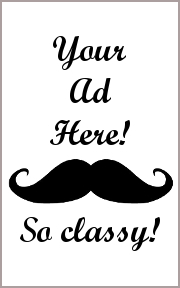 The space you just grabbed could be taken from you, but everything comes at a cost. This was a great way to balance what would seem to be a real game changer. The Bird and Rabbit destroy or create possible points, but it always costs the player a Player disc and a turn (i.e. a turn) to make it happen.